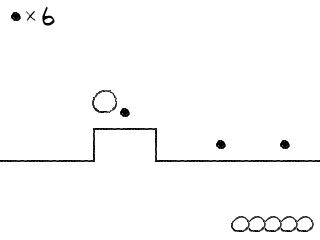 In Rakukore, the aim of the game is to guide a ball towards it's end level destination while attempting to collect as many black dots as possible. The left and right cursor key can be used to change it's screen position. Tap the left shift key to jump. Press the same button repeatedly to execute a double or triple jump. Use the control key to pause the game or cancel a selected option. MattC - "There are actually five difficulties with four levels each. Once you beat a set it opens up the next. After all five there is a "high speed" version of each. Once a level is available in campaign mode, they're available in free mode as well. Ctrl is pause/back."